Abraham Lincoln was known for his sense of humor. But in 1842, early in his adult life, it nearly got him into trouble. 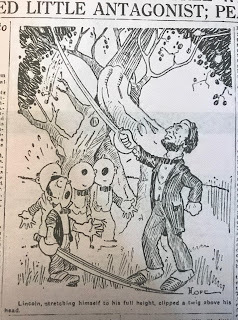 When Lincoln became frustrated with the actions of political rival James Shields, he came up with a plan that was silly, clever, and a great big mistake! Lincoln, his future wife, and a friend of hers wrote a series of fictional letters to the editor, complaining about Shields. But when Shields took offense, he challenged Lincoln to a duel. We asked author Donna Janell Bowman some questions to help provide insight into her research for Abraham Lincoln’s Dueling Words and explain the importance of telling this little-known story. Q: How did you come across the story of Abraham Lincoln’s almost-duel? What inspired you tell the story in a picture book? A: In late 2011 or early 2012, I was working on my book Step Right Up: How Doc and Jim Key Taught the World About Kindness (Lee and Low, 2016) which spans the Civil War and Reconstruction. During that research, I couldn’t help but bump into Lincoln references. A lot. At one point, I read something in a magazine or online that read something like “as ridiculous as Lincoln’s duel.” I was so intrigued I had to know more. I was immediately hooked! I always envisioned the story as a picture book, in part because the entire event lasted only a few weeks. It also seemed a perfect story to tie in with character education in schools. And, let’s face it, the visual opportunities were terrific, as we see in S. D. Schindler’s beautiful art. Q: What is your research process like? A: The process is different for every book I work on. To be honest, it starts out a bit scattered as I read widely and absorb various details. Once I refine my angle, I get organized and focus my research with more efficiency. For Abraham Lincoln’s Dueling Words, my research was quite broad. I read a bunch of Lincoln and Shields biographies, books about dueling and 19th century etiquette, and terrific sources about the political and financial climate in Illinois and the U.S. So many of the concepts were foreign to me. 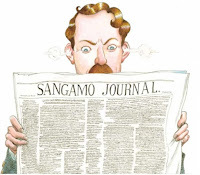 I was most excited to find the issues of the Sangamo Journal where the Rebecca letters were published and where the two “seconds” (duel assistants) published their accounts. I think it’s important to examine both primary and scholarly secondary sources during research because that’s how we find truth beyond a single perspective. I’m grateful that so much Lincoln material is digitized and available online through the Library of Congress, Project Gutenberg, Archive.org, newspaper archives, universities, and a number of museums and historical societies. But there is no substitute for on-site research and input from scholars. Dr. James Cornelius, Curator of the Abraham Lincoln Presidential Library was very helpful to me. And walking the streets of Springfield, the recreated town of New Salem, and the Lincoln-Shields Recreation Area (formerly Bloody Island) were invaluable. Q: When researching for the book, what were some of the most surprising or interesting facts you came across? A: I was fascinated by so much of what I learned! I suppose the most profound revelation for me was that Lincoln was a flawed human being. Like most people, I always thought of him as the perfect American—a polished, monumentalized defender of justice. The great emancipator. He is arguably the most revered president in U.S. history and is often the standard we measure every presidential candidate against—for good reason. But, the truth is, Lincoln made his share of bad (even politically malicious) decisions and mistakes as a young man. In fact, he later referred to the Rebecca letter and his scrape with Shields as “the meanest thing” he had ever done. He was so ashamed of it, he refused to discuss it. I emerged from research with a new understanding of Abraham Lincoln as a flawed human, like the rest of us. Learning about dueling practices was also fascinating and I found out a lot about deportment and etiquette of 19th century America. There was a reason for all that bowing, hat-tipping, and formal note-writing. Before my research, I didn’t understand how important honor was to men of Lincoln’s day. To be a gentleman, one was expected to behave a certain way. Having the respect and esteem of others was a man’s greatest asset. Sometimes, I think we need a smidgeon more of those concerns these days. Q: What makes this book different from the many other books out there about Abraham Lincoln? A: You know, I read that there are more than 16,000 biographies about Abraham Lincoln. He is likely the most written-about American figure in U.S. history. Though many adult biographies explore the foibles, character flaws, and missteps of famous Americans like Lincoln, biographies for young readers most often keep the spotlight on noteworthy achievements, positive traits, and uplifting themes. Before I began writing my book, I struggled to find a single mentor picture book biography about a less-than-stellar side of any famous person. That worried me for a time, but I think there is tremendous value in acknowledging the flawed, human side of our subjects. Abraham Lincoln’s Dueling Words shines a light on a darker episode of Lincoln’s life and how it inspired him to be a better man. A: Once I’ve absorbed the research and organized it all into binders and files, I step away from it to let the information swirl and settle. I usually work on other projects during this time, but I am often found staring out the window, walking the dogs in a daze, doodling, scribbling, and generally appearing to daydream for days or weeks. That’s my pre-writing time, when the various story pieces find their way into a logical order. Every writer is different, but I like to know how my story will end before I begin—whether it’s fiction or nonfiction. That was the case with Abraham Lincoln’s Dueling Words. I knew the ending and the beginning right away. Even the narrator’s voice became clear during that pre-writing time. One of the biggest challenges was deciding what information was crucial to the story and what had to be left out to fit the confined space of the picture book. After a bazillion revisions and a long, long wait, it is immensely rewarding to see my words and the illustrator’s art morph into an actual book. Q: Why do you think that this story isn’t more widely known? A: It is interesting that most scholarly Lincoln biographies don’t mention the duel. I think there are a number of reasons for its obscurity. Unlike the Hamilton-Burr duel, the Lincoln-Shields duel occurred long before either man was nationally known. And nobody was killed or wounded, so it is easy to overlook the event as a trivial anecdote—until you consider what might have happened in our country if Lincoln had been arrested or killed as a young man. And, short of that, consider how much the event changed Lincoln’s character. Documentation-wise, the duel is like a missing chapter in the Collected Works because Lincoln was so ashamed of the event he refused to write or talk about it. Thankfully, primary sources survive. Q: This book not only provides details about Lincoln, but also about dueling. Was your approach to researching about dueling different from researching about Lincoln? A: Researching Lincoln was about considering him as an individual, warts and all. 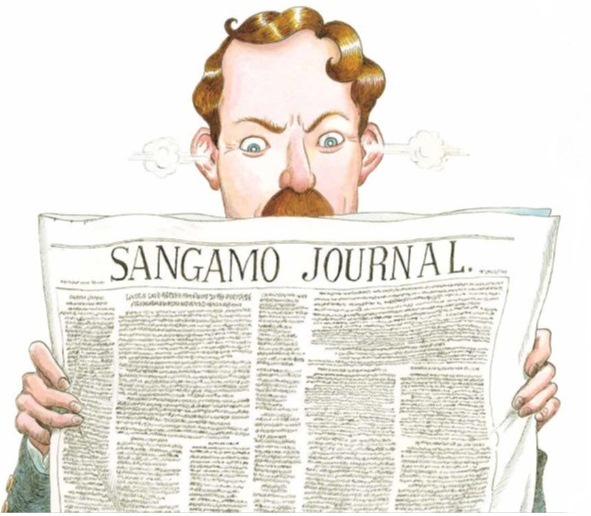 Researching the dueling practice required a broader, global perspective. Dueling is such a foreign concept to me it was both thrilling and nerve-racking. Thankfully, I didn’t have to dig too deeply to uncover the Irish Code Duello, the 1838 Code of Honor, and various articles about the topic. Q: What are some of the challenges in writing a nonfiction book for younger readers? A: There are multiple challenges, beginning with the fact that authors of books for young readers are not writing for their own peers. It is easier for adults to write for other adults. To write for kids, we have to be pragmatic professionals AND storytellers who can tap into our own inner child. Unlike, say journalists or adult biographers, we must be able to distill facts and concepts for the interests and developmental levels of today’s kids. And we have to present it in an entertaining way. That is no small feat! Kudos to the countless gifted children’s authors who continue to inspire me as a writer! Often, people don’t realize that writing a 32-page picture book biography often requires the same research as an adult biography. One of the challenges is letting go of very cool information that doesn’t fit the story or the form. Q: Your writing style is very witty and fun to read aloud; how do you balance writing about the seriousness of a topic like dueling with a fun narrative voice? sword, the plank, and the confined box for the dueling ground. I wanted to bring some of the ridiculousness forward. 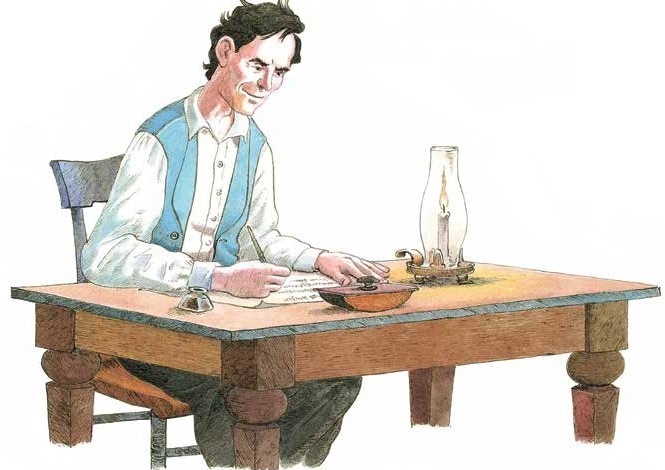 I chose to use a narrator with a southern dialect to make the story more palatable for younger kids while winking at Lincoln’s style. The light-hearted tone doesn’t lessen the truthfulness of the story, but I hope it adds an extra appeal for kids. Q: What do you hope readers will learn from this book? A: By learning about Lincoln’s great big mistake, I hope readers begin to see him more three-dimensionally—beyond the face on the penny, the five-dollar bill, the monuments, etc. I hope he becomes more relatable. 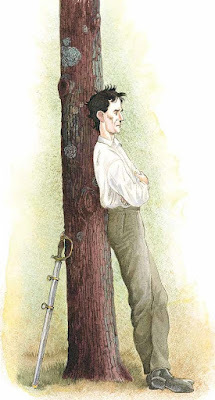 And, by pondering the timing of his mistake—early in his adult life—I hope readers will see how Lincoln had a choice to make, following the duel; he could allow his mistake to define him, or he could learn from it. I also hope readers will see themselves and their own human flaws in Lincoln’s great big mistake. I hope they become curious about the real people behind the most famous faces in the world. And I hope they find comfort in knowing that nobody is perfect and, sometimes, that imperfection can spark greatness. Find Abraham Lincoln's Dueling Words at your local library, indie bookstore, or Barnes & Noble April 1!